A new way of controlling the Dynamixel servos is via the USB2AX V3.2, available from places like Trossen robotics and Seeed Studio for around $40USD. Note that stock levels seem to be all over the place. 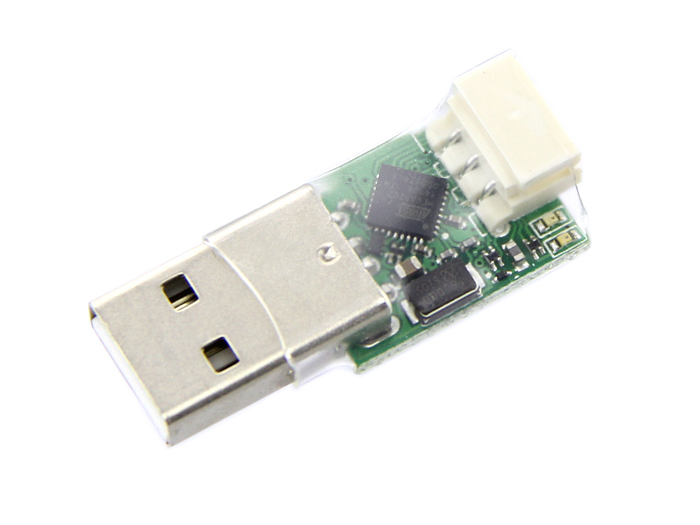 This has the advantage of being significantly smaller than the OpenCM and requires no soldering of connectors (eg. because they discontinued the OpenCM 9.04b) and for the serial port. It is now possible to build the robot with no soldering at all! (And just some screw terminals). Here is a step-by-step on how to get this working with the Raspberry Pi. This was tested with a Raspberry Pi 3 but the instructions should still work on any Raspberry Pi with a recent version of Raspbian and Python 3. This is not a perfect instruction – it’s just the first thing I tried that worked so can be improved! Download NOOBS from https://www.raspberrypi.org/downloads/ . Follow instructions in downloaded NOOBS package ( INSTRUCTIONS-README.txt ) to write to SD card. Boot Raspberry Pi with HDMI monitor, keyboard and mouse plugged in. Install Raspbian (may take a while). Look at Dynamixel Python library at https://pypi.python.org/pypi/pyax12/0.4.dev6 (there are a bunch of libraries, this seems to be the most recent). Connect the USB2AX to the USB port, and connect up the servo and power.